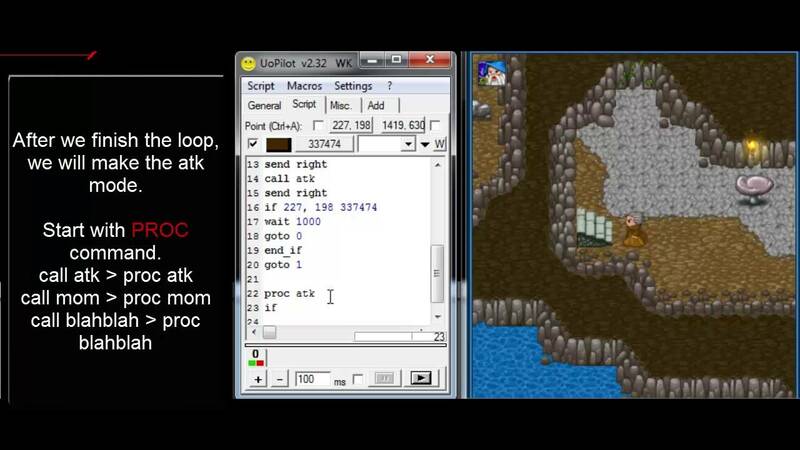 The processing of the parameters in the 'dir' command was reworked when called from Lua. Added ability to customize the output to a log for each script, with the command 'set logging mode [options]'. Fixed in 'findimage' the return of the percentage of the match of the found picture in the fifth element of the returned array. 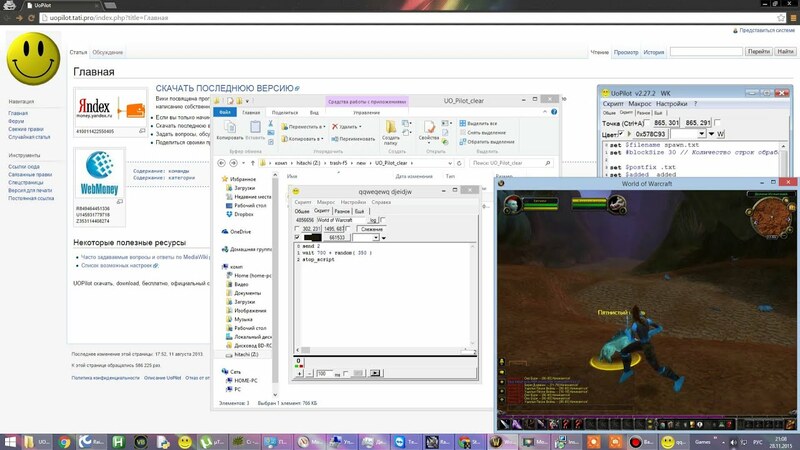 Tested only on xp Added hot-key, which allows to switch the display of the progress of the script "ShowScriptProcessing". Fixed returning a table of values in the 'scripts ' command in Lua. Has added an opportunity of entering uoppilot variable colors of a point, on the given coordinates on the screen, with the help of a keyword Color in the command 'Get'. Returns the coordinate offset and the correct handle, or 0. So uopilo only versions 5. According to the Lua syntax, in the path it is necessary to double the backslash character "c: Added the function 'CharToHex '. When searching for the handle returns an incorrect coordinate "y" start subtracted. The Lua library is loaded and initialized only when the script is run on Lua. Added module addressing in commands of memory operations. Fixed a memory leak that occurred when the Lua version was changed. Added the ability to change the category of existing keywords and add new ones. Changed the way to install the keyboard layout in the 'SetLayout' command. In all the commands for moving the cursor and mouse clicks, added the ability to specify the handle of the window instead of the 'abs'. Added in the 'prompt' the possibility to display any title Has made loading scripts under numbers on which they were at closing the pilot, instead of the order. When the program is started, it is checked for its presence in the folder, and if it is not, then unpack it. It is possible to set the list of keys. Added to 'findimage' the return of the percentage of the found image in the fifth element of the returned array. In mouse clicks added ability to set random offset of coordinates within the specified range: Indicate with parentheses as a function. If the image cannot be received, or a black square is returned, the parent handle is taken and checked again until the image is received. Corrected display the table for editing hot keys for scripts, when resizing the screen fonts. Added the function of uopklot the image to the file 'SaveImage Address filename '. Added the function of determining the base address of the loaded module uopi,ot var ModuleAddress [handle PID] '. Fixed 'get windowpos' in Lua. Now the variable 'errorlevel' contains the PID of the running process. To do this, they need to specify in the plugin, when setting the function name: Fixed command 'log close', when he opens the closed log. Downloads page directly to the Wiki, stores in the folder "Help", next to the pilot. Fixed the 'findimage' and 'findcolor'. Added display of the handle of the window to which is attached the active script Corrected the error when you hold the hot key to run script. Corrected the function to format the script, added the function "remove formatting". When you open a Wiki page for RMB on the command in the script, sets the focus on the article itself, not on the drop-down list. Fixed broken wheel mouse commands. Remade the command 'Exec' as 'ExecAndWait'. Added restore icons in tray when restarting the explorer.